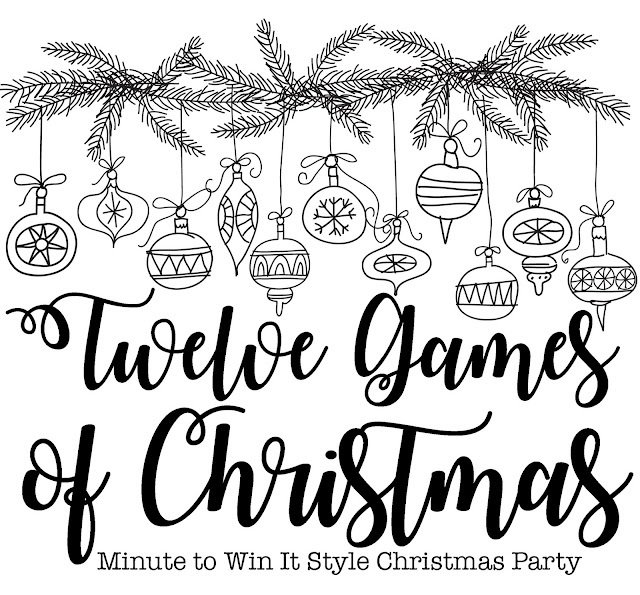 Last night our Bible Fellowship Group hosted our 2nd annual "12 Games of Christmas" party and we ate, hung out and competed in 12 minute to win it style games. I thought I'd share the games we played in case you're in the market for some entertainment for an upcoming Christmas party, a youth group event, Christmas Eve with family, etc. Keep in mind we played ours as "Guys vs. Girls" so that's how the instructions are written out. Two girls and two guys will be competing against each other as a team. One is the tree and the other is the wrapper. The tree stands with their hands above their head (like a tree) and the wrapper has to wrap as much toilet paper around them as possible. The team with the most used paper at the end of one minute (or the team to use all of their rolls the fastest) wins. Each player will have a bowl of mini marshmallows and they have to make as many “snowmen” (stacks of 3) as they can in one minute. The person with the most snowmen at the end of the time wins. Contestants must transfer 25 M&Ms from one plate to another using only a straw. First person to complete the transfer (or person with the most done at the end of one minute) wins. Stack 36 cups into a Christmas Tree form (starting with a base of 8) the quickest using only one hand. Two girls and two guys will be competing against each other as a team. One member of the team has to unwrap Hershey kisses and toss them into the mouth of their partner. Whoever catches the most kisses at the end of one minute wins (or whoever gets one first if no one has caught one after a minute). Players must quickly go through a bowl of red and green candies and divide the candies (one candy at a time) into separate bowls across the room labeled naughty or nice. Red candies go into the naughty bowl and green candies go into the nice bowl. Supplies: Red and green candies, two bowls. Each player will have a bowl filled with 10 cotton balls. They’ll be blindfolded and have to “shovel the snow” from one bowl to the other using a plastic spoon and one hand. Move candy canes from a pile on the table to a bowl using only a candy cane that you’re holding in your mouth. Person who transfers the whole pile the quickest OR who has the most at the end of one minute wins. Each person has a “gift” that’s been wrapped in an entire roll of Saran Wrap. The first person to get their gift out wins. Draw a Christmas tree. Add decorations to your tree. Each person has an ornament on the floor. They have to push it from Point A to Point B using only their nose. Fastest player wins. Each person has a bowl with 30 marshmallows. Whoever can eat the most in one minute (or whoever finishes their bowl first) wins. We had SO MUCH FUN!!! We did this same kind of party last year as well. I gathered the ideas from Pinterest and Google searches and tried to pick games with easy and inexpensive supplies. Hope you found a game or two to play this Christmas Season!!! You party planned like a BOSS! This was such a fun night! Last night when we were in bed Tab randomly said, "You and Brooke were freakishly good at the toilet paper game." Hahaha! Oh my goodness, SO MUCH FUN last night!!! I'm a huge fan of party games! We are hosting family Christmas this weekend and I'm adding some of these to my list. Thanks! Thank you for these FUN ideas, Andrea!! You are one awesome mom! I love your blog! I am a Minnesota mom and kindergarten teacher with three teenagers. My sister lives in Georgetown, TX and I LOVE your style, your ideas and everything about you!! SO FUN! Thank you for sharing!!! You are an answer to my hopes for some new ideas for this Christmas. Thank you and Merry Christmas! How fun! Thanks for sharing! Merry Christmas! Oh these are a must for family Christmas!! Thanks girl! Your timing is perfect!! We are hosting our lifegroup Christmas party tomorrow night and were trying to throw together some games like this with minimal supplies!! I going to print this out and run to the store for a few things and we will be golden. Thank you so much!! You rock! These are such fun wholesome games that the whole family can play. I am so going to do these! Now, I wanna see how you set everything all up. Please tell me you took photos!! Pretty please. Oh my you have given us so many to play, this is great. I know these games will be played at Christmas, I can't wait to get everything together to set them up. Thanks for sharing. This post was timed perfectly for the students in my 4th grade classroom, as well as the start of winter break with cold weather and energetic boys! Thanks so much for these awesome ideas! !